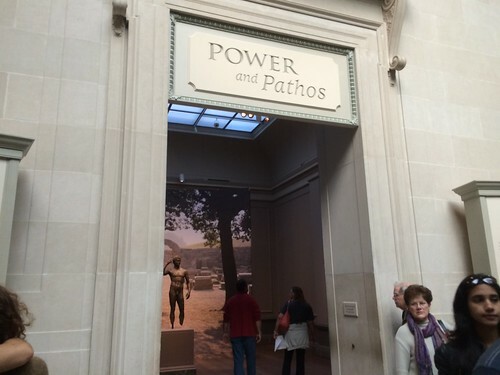 Power and Pathos: a traveling collection of extremely rare Hellenistic bronzes from the 4th Century BC to the 1st Century AD. The Serial Impulse at Gemini G.E.L. : collection of multi-part print series by 20th Century artists at the Los Angeles print studio Gemini G.E.L. (Graphic Editions Limited). Louise Bourgeois: No Exit: the late Louise Bourgeois died in 2010 at the age of 99, leaving an amazing corpus of existentialist art. I also learned her marble sculpture Germinal was once redone in chocolate. Celebrating Photography: recent acquisitions for the museum’s photography collection, including Richard Avedon’s The Family. 17th Century Dutch painter Jacob Ochtervelt’s A Nurse and a Child in the Foyer of an Elegant Townhouse. Yes, that’s a 5 year old boy in a dress, as was the style at the time. On Sunday we also dropped by the National Geographic Explorers Hall to see Pristine Seas, photos from marine conservation expeditions led by NGS Explorer-in-Residence Enric Sala around the world.